An innovative British-developed refrigeration system is now being offered in a new format in order to try and penetrate markets outside the UK. 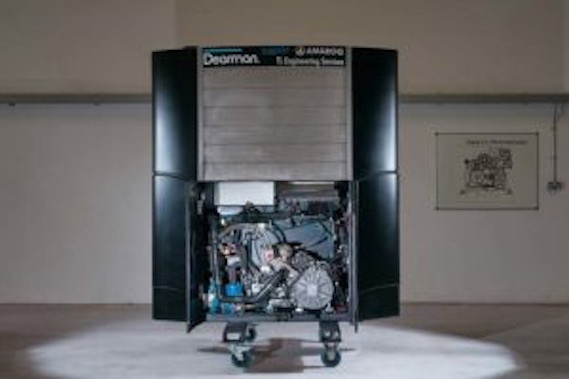 The Dearman Hubbard zero emission transport refrigeration unit, which uses liquid nitrogen as a power source rather than diesel, has been introduced in ‘nosemount’ format, which can be fitted to the front of a trailer rather than underslung, which is how the current Dearman refrigeration unit is fitted. Like the undermount unit, the Dearman Hubbard Nosemount enables trailers to be configured as single or dual-temperature. The zero emission system runs quietly, and operating at less than 60 dB, meaning it is complaint with most urban noise limit regulations. The enhanced range will be available to fleet operators in both Europe and North America, regions being where the company has recently appointed new Vice-Presidents to lead its sales operations. The liquid nitrogen refrigeration unit eliminates nitrogen oxide and particulate matter emissions, and has so far been taken up by Sainsbury’s, Unilever and Marks & Spencer.